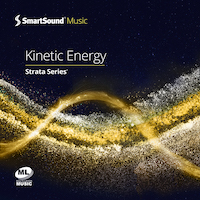 Discover a wide variety of electronic beats in Kinetic Energy, ranging from dramatic to uplifting, from relaxed to thoroughly intense. Experience tracks with a modern, electronic sound featuring aggressive synthesizer lines and drum beats, yet also gentle guitar sounds and string melodies, suitable for carrying a large spectrum of emotions. All tracks are available in distinct mood mixes and variations, thanks to SmartSound's Custom Music Timing technology, powered by Sonicfire Pro.